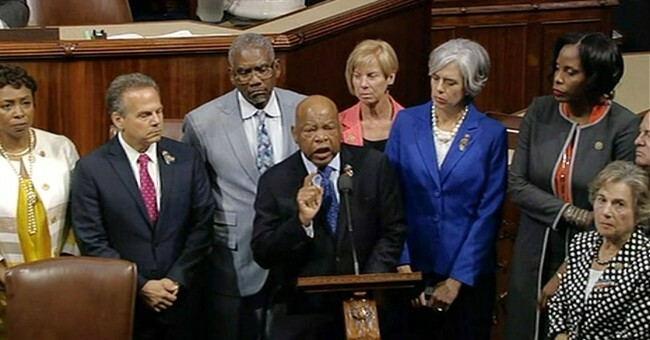 House Democrats ended their sit-in protest on gun control Thursday, a full day after they seized control of the floor. The protest wrapped up with closing remarks by Rep. John Lewis (D-Ga.), who helped spearhead the effort, and a rally with supporters outside the Capitol. Democrats vowed more action when the House returns after the July 4 recess. “Members of our Caucus are still on the Floor speaking about No Bill, No Break. Please come to the Floor to continue showing unity and to relieve colleagues who have been on the Floor since the House adjourned earlier this morning,” read the notice blasted to the Democratic caucus this morning. Rep. Lacy Clay (D-Mo.) led a group of non-members into the House chamber about 10:30 a.m. and huddled with them off to the side, a move that is allowed because the House is currently not in session. Several lawmakers had vowed not to give up until they get votes on their gun control bills. But the House adjourned until July 5, and Democrats decided to shut down their historic protest. Speaker Paul Ryan aptly noted that this was nothing more than a publicity stunt and a fundraising campaign. He also said these antics degrade the institution. Regardless, for now, this occupation is over. Hill Democrats seized the floor around 11:30 a.m. yesterday and remained throughout the night. Sens. Bernie Sanders of Vermont and Elizabeth Warren (D-MA) joined their colleagues in an act of solidarity yesterday. Did it bring attention to the issue? Yes. Was it also a colossal waste of time over a bad gun control bill that strips Americans of their constitutional rights without due process of law? Absolutely. House Republicans quickly adjourned all business this morning.